Organizing the Club into a three-section percussion instrument proved difficult. If you’re living in the Columbia, MD area and looking for a way to give back to the community in a fun, witty atmosphere, let me recommend the Rotary Club of Columbia Patuxent. I spoke to about 30 members there yesterday. You couldn’t ask for a livelier bunch, even at 7:30 AM. 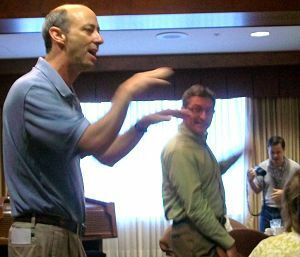 Over the past six months I’ve been speaking to a number of Rotary Clubs about benefit auctions and — dang it — I’ve no idea why I haven’t been blogging about it. It never occurred to me before, despite having met some wonderful people from Florida to Maryland. 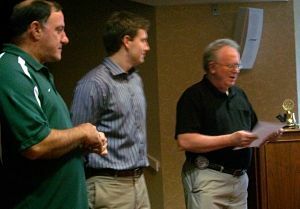 New member induction at the Rotary Club. The Club has an excellent Website which is worth visiting. Along with the usual announcements, I was able to witness a new member induction and a solo from a member who sang for dollars to give to Rotary Foundation. While giving Happy Dollars (announce something you’re happy about, and give a dollar or more in appreciation of that), a Rotarian shares how her husband and she enjoyed a fabulous vacation in Ocean City, MD all by themselves, meaning they took no children. A Rotarian puts in a Happy Dollar because it’s her birthday. “No matter how old I get, this club makes me feel young,” she smiles. 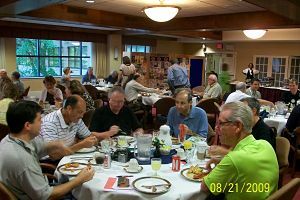 The Rotary Club of Columbia Patuxent has a breakfast meeting. “Hey, you’ll fit right in here!” several Rotarians nod good naturedly. There were several other memorable experiences, but that gives you a taste of their approach. Special thanks to the Club for letting me speak! I enjoyed your atmosphere, and I hope your crab party this weekend pulls through without rain.